History: middle aged male with knee pain. Lipohemarthrosis – Sagittal STIR image reveals dependent layering of the cellular component of the hemarthrosis noted by the fluid-fluid level (yellow arrow). 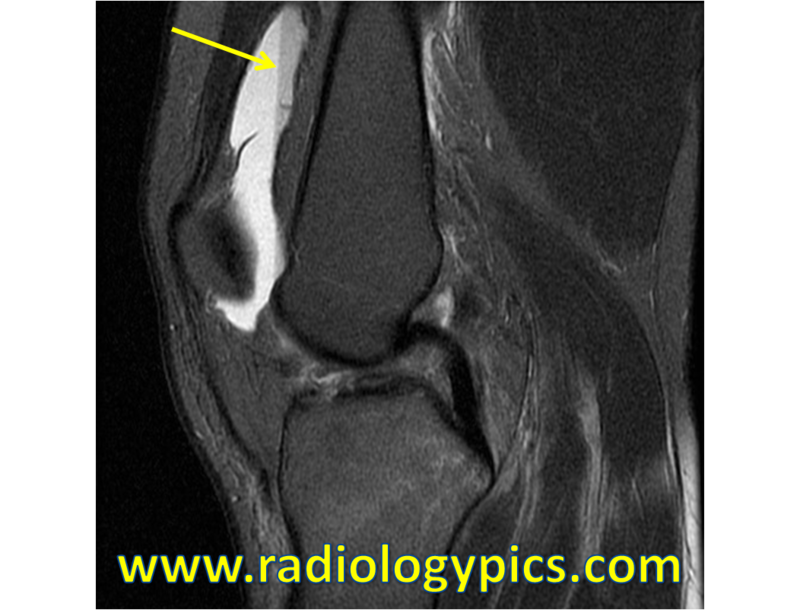 Lipohemarthrosis – Coronal T1 weighted image of the knee reveals numerous fat droplets (yellow arrow) floating to the non-dependent portion of the patient’s knee around the patella. Lipohemarthrosis – Coronal STIR image of the knee reveals the droplets’ signal drops out, indicating they are fat droplets. 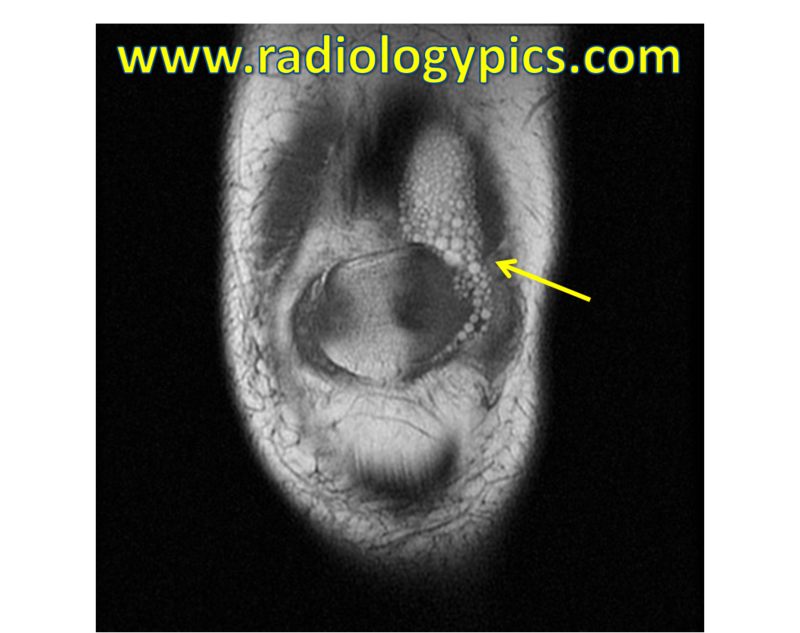 This is a case of lipohemarthrosis beautifully demonstrated on MRI. 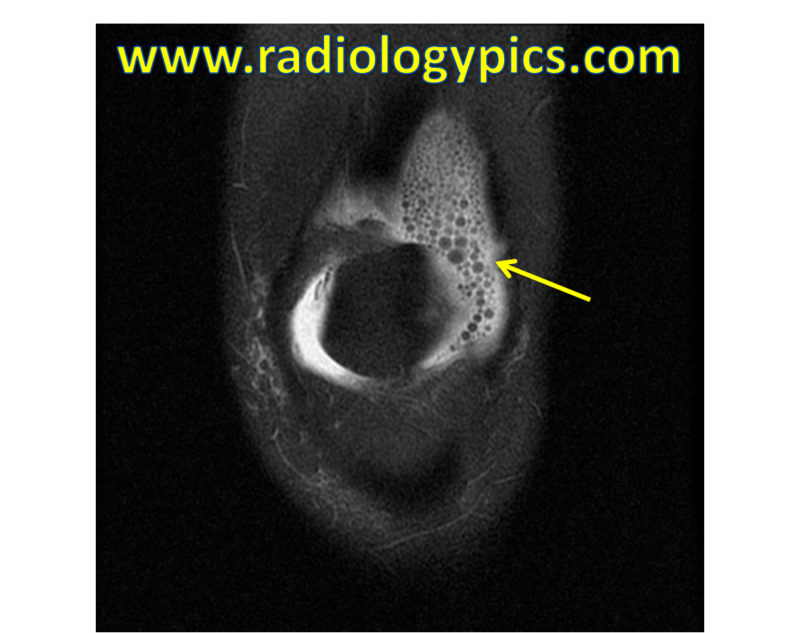 Lipohemarthrosis is simply the presence of fat and blood in a joint effusion (see a large knee joint effusion here), and it typically is caused by a fracture at the articular surface of a joint that extends into the bone marrow, allowing fat to leak into the joint space. MRI is the ideal imaging modality to diagnose lipohemarthrosis with its capabilities of identifying fluid with differing signal parameters. 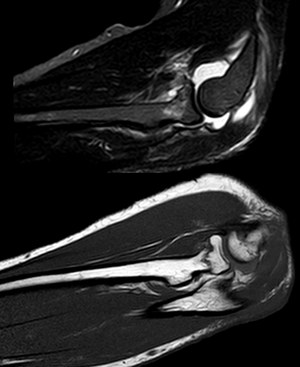 Fat will float to the non-dependent portion of the knee, which in the supine patient being imaged in a magnet will be around the patella, as seen on the second two images above. The hemarthrosis portion of the effusion will further layer out into serum and cellular components (somewhat like a centrifuge), giving the fluid-fluid level seen above. For an excellent resource on lipohemarthrosis of all joints, read Dr. Gentili’s site here.